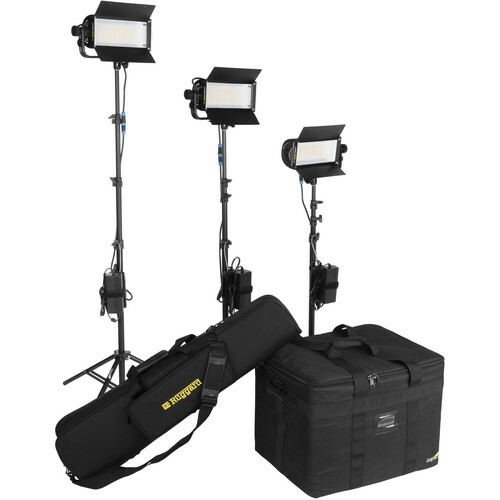 Max Height: 121.5", Min Height: 40.5"
This Lowel TotaLED Daylight LED 3-Light Kit put together by B&H includes three TotaLED Daylight LED lights, three air-cushioned light stands, a large light kit bag, and a padded light stand case. The TotaLED floodlight features a 750W tungsten equivalent, upholding the brightness standard of the original Tota light. Each light in the kit has 160 5600K LEDs, a large heatsink with fanless design to keep the light cool, a 100° beam angle, a V-mount battery plate, a built-in yoke, features 100-0% stepless dimming, weighs less than 5 lb, and comes with a carry case. The included 4-section light stands support up to 8.5 lb and extend to a maximum height of 121.5". The included light kit bag and light stand case are padded, made of nylon, and feature zipper closures and shoulder straps. See below for more information about the items in this kit. Filming an Interrogation Scene with the New LOWEL TotaLED LIGHT! Update your lighting kit with the bright, compact TotaLED Daylight LED Floodlight from Lowel. A modernization of the old Lowel Tota light, the TotaLED retains its powerful 750W tungsten equivalent brightness, but this model is updated to a daylight LED panel with sturdy metal construction and a large heatsink to keep it cool when operated for long periods. Its fanless design also keeps it quiet on set. The light's 160 5600K LEDs have a long, 50,000-hour lifespan, so you won't have to change any burned-out bulbs. Its 65° beam angle covers large areas with ambient light, and you can slide in the removable diffuser panel to broaden the beam angle to 100°. The light is powered by a controller box that connects to the light with a 4-pin XLR; connect either an AC adapter or use the built-in V-mount plate with a separately available battery. The box also features a knob for 100-10% stepless dimming - which can then be brought down to totally 0%, a mounting slot, and a hanger loop for hanging on a stand. The TotaLED is supported by a built-in tilting yoke with a 5/8" mount, which is tightened by a large locking knob. The yoke also features a shoe-style mount to attach your controller box by its mounting slot. Further up the yoke, there's a 1/4"-20 accessory mount for adding gobos or flags. There's also a separate umbrella mount with a small locking knob that can support umbrellas up to 45". Its built-in two-way barndoors help you shape the light, and there are two integrated gel clips on the outside of each barndoor. The barndoors fold down to protect the light panel when not in use. The included AC adapter can be used worldwide with optional plug adapters, and it all comes in a carry case to protect and transport the light. The TotaLED offers the equivalent brightness and luminance of a 750W tungsten bulb. This fixture illuminates large spaces where you need to increase the level of ambient light. The included diffuser broadens the beam from 65 to 100°. With a color temperature of 5600K, you can match the color temperature of light coming through windows. If you need to match the color temperature of other tungsten fixtures, use the integrated gel clips to add a tungsten gel (available separately) to the light. You might need to shape your light and prevent light spill onto your background. The integrated barndoors will narrow your beam for the perfect group portrait. The light operates on either V-mount battery or AC power, so you'll never be left without a way to light your subjects. The fixture operates quietly without a fan, so it's also a great choice to light video shoots when you're recording live sound. The large heatsink makes it possible to operate the TotaLED for long periods without overheating. This light weighs less than five pounds and comes with a convenient carry case. The TotaLED is capable of running on North American and international voltages. Take it with you when you're leaving the country to shoot abroad. Just remember to bring the appropriate plug adapters (available separately). The 23 x 18 x 17", black LKB-5C Light Kit Bag from Impact is a lightweight yet durable case designed to safely transport and protect lighting equipment. Ideally sized for LED panels, it is also suitable for studio strobe systems, continuous light systems, and a variety of equipment needed in the studio or on location. The outer shell and interior walls are all reinforced with heavy-duty plastic panels to ensure the structural integrity of the bag. Adjustable dividers can be configured to your needs within the 20.5 x 16.5 x 15.5" interior to keep your lights and gear organized and secure. A generous zippered mesh storage compartment provides plenty of room for cables and other small accessories. The LKB-5C has a weather resistant, heavy-duty 600-denier ballistic nylon shell fitted with anti-slip rubber feet. Carrying options include a detachable, adjustable shoulder strap, overlapping top handles, and rubber grip side handles. For added security, the heavy-gauge dual zippers accept an optional lock. A heavy-duty 600D nylon shell shields your lighting equipment from moisture and dust. Sides of the bag are reinforced with heavy-duty plastic panels to ensure the protection of your gear from impacts encountered during transport. The interior lining is gray for locating gear in low light. The double zipper closure provides easy access to your gear, and features loops that accept a lock (sold separately). The zippered mesh storage compartment in the lid is ideal for securing and organizing cables and small accessories. The removable, easily adjustable shoulder strap includes a cushioned shoulder pad for comfort. Heavy-duty rubber grip side handles add lifting and carrying options. The three internal dividers can be configured to your needs, keeping your gear secure by preventing contact that could result in scratches. The padded L-shaped side panels use multiple strong touch-fastener strips on the interior walls of the bag, forming a rigid rectangular shape under the weather-resistant outer shell. Once the panels are secured in place, no further setup for future use is needed. For added security, non-slip rubber feet are attached to the bottom of the bag. This Impact Air-Cushioned Light Stand is a black anodized aluminum support that rises to a height of 10' and folds down to 33.5" for storage and transport. The stand will handle up to 8.5 lb and is topped with a 5/8" stud with 1/4"-20 threads. It has a wide footprint of 38" for greater stability. Air cushioning gently lowers the light when making height adjustments to protect equipment and fingers. The black with yellow embroidery, 35" Padded Tripod or Light Stand Case from Ruggard is an affordable, lightweight, and functional way to store or carry your tripod, light stand, and umbrellas. The durable 400D nylon exterior is complemented by a smooth 150D nylon lining. Dual top zippers provide full-length rapid access to your tripod. This case can be transported by its two top carry handles, or by its very useful fixed-length shoulder sling. For added storage, there is an exterior 13.5" zippered pocket. The case is accented with a large, handsome yellow embroidered Ruggard logo. This 35" Padded Case is backed by a one-year limited warranty from Ruggard. Box Dimensions (LxWxH) 16.0 x 14.0 x 6.2"
Box Dimensions (LxWxH) 22.0 x 18.0 x 7.0"
Box Dimensions (LxWxH) 34.0 x 3.0 x 3.0"
Box Dimensions (LxWxH) 15.9 x 10.9 x 1.8"
Does it come with three batteries?